Infants communicate with their caregivers from the word go. They love to make eye contact, to hear ‘motherese’ and to engage in exquisitely timed ‘dyadic’ exchanges where they coo or smile and their caregiver responds. From the very beginning, adults pick up on this. They treat their infant’s gaze, gestures, smiles or babbling as communicative signs, and respond in kind. These contingent responses in turn promote an increase in smiles, babbling and gaze. Human beings are born with motor, perceptive, cognitive and social skills that enable communication. For instance, as newborns, we prefer to listen to human voices rather than to other environmental sounds. We also prefer to look at human faces and display an innate capacity for social imitation. Nevertheless, during the first two months of life, newborns are not very active social partners. They have only rudimentary means of communication, expressing themselves by crying or producing vegetative sounds, whimpers and some facial gestures. These are mainly comfort-oriented or related to the need for hunger relief. Although they may show interest in social stimuli (faces, etc. ), newborns need time to develop their own communicative skills. Towards the sixth or eighth week of life, babies often produce their first smiles and, with them, comes the ability to exchange emotions and interact face to face with adults for longer periods. Between the third and sixth month of age, infants gradually increase their expressiveness and start to structure their communicative behaviour, displaying turn-taking in face to face interaction. By participating in these exchanges, infants gradually widen their repertoire of communicative acts, for example, by using hand movements, by improving gaze coordination, by vocalizing and gesticulating, and by clearly showing a smile that denotes pleasure and comfort. 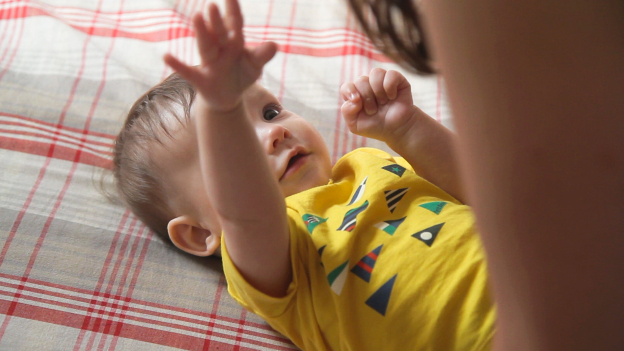 In these first interactions, infants share emotions with their caregiver. With time, the ability to regulate interaction develops, so that infants become able to make the external world the topic of conversation with others. For example, they might extend a hand towards something they want. In doing so, infants become able to engage in joint attention (where the infant and caregiver both attend to the same external thing and are mutually aware they are doing so). Adults play a crucial role as newborns’ first communicative partners. How can we foster interaction? Trevarthen, C. (2014). Proto-Conversation and Song in Infant Communication. In Brooks, P.J. & Kempe, V. (eds.) Encyclopedia of Language Development, 501-508. These contingent responses promote an increase in smiles, babbling and gaze. Infants gradually increase their expressiveness and structure their behaviour, displaying turn-taking in face to face interaction.